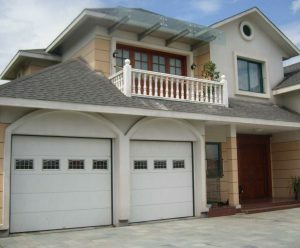 In North America, the majority, if not all garage doors are the sectional kind. Their height can range from 18-24 inches, or 46-61 centimeters. These garage doors are often equipped with automatic garage door openers. This is not the case for Europe. Europe does not often use the common sectional doors of North America, they have more variety, such as side-sliding sectional doors, single-panel up-and-over doors, and even rolling doors. According to Garaga‘s Jean-Francois Morin, another difference between the two countries is that Europe uses the metric system to determine garage door sizes in all of the country except the United Kingdom. So in North America a door that would be measured as 8 x 7-foot, would measure as 2.4 x 2.1 meters in Europe. A standard garage door that is a single door is 7 x 7 feet. 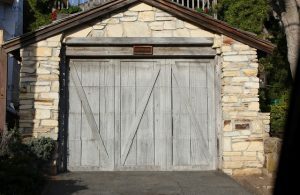 North America used to use the single panel up-and-over garage doors as it was quite common in the United States and in Canada back in the 50s and 60s. For those of you that don’t know, this type of door was made as a single piece that is secured by a well built steel frame. When opened, the swing arc has been known to extend past the garage or it can also remain inside the garage completely. The mechanism for the lift, that holds the extension springs is found on each side of the door. For those of you that are not familiar with how residential construction in Europe works, concrete is much more common compared to wood construction in North America. It is what makes this style of single panel up-and-over garage doors more popular in Europe due to the ease of installation. To install, it is a simple attachment of four bolts to the concrete door frame, and doing a small amount of refinishing. That’s all it takes! The only downside is that to transport the entire system it will be necessary to use a truck with a cherry picker. The reason for this door’s disappearance in North America is actually rather simple. It is due to the fact it is not very useful in the winter. Due to the fact that the garage door swings partially outward, the snow will have to be cleared before the door can be opened, which makes for an irritating situation. If the door swings completely inside, a new problem arises that there has to be a good amount of space between the vehicles and the door. Rolling doors are available in North America, but we normally only see them in commercial garage doors, not for residential buildings. This type of garage door is made from strips of aluminum, PVC, and sometimes steel. As the name implies, they roll up above the garage door header. The strips sometimes vary for height, but are more often than not around 4 inches, or 10 centimeters. They are rather simple but require more clearance and less variety compared to sectional doors. Last but not least is the side-sliding sectional doors, which open laterally on one side of a garage. This door functions through the siding along a rail that is installed on one side and connected to the floor. This door is more expensive and can be motorized but is also not an attractive option for anywhere it snows. It will have to have a heating cable installed for these areas which only increases the price. So in this blog we explained the difference for residential garage doors in Europe compared to North America. The one thing that we haven’t gone over is the difference in price for the two locations. The regulations for safety for garage doors, guarantees offered to homeowners, and the higher price of labor costs in Europe make the cost of a single sectional garage door cost double the amount it would in North America. If you need an upgrade or repair to your garage door, don’t hesitate to call Clarks Garage Door & Gate Repair. We offer detailed estimates and custom quotes to fit both your need and your budget. Clarks Garage Door & Gate Repair can offer you advice on what the right choice for you is, so give them a call today at (877) 622-8183 for more information.